The sun still shines above the peaks of the mountains and spoils the Vinschgau District in South Tyrol with its warming sunbeams when autumn already embraces Europe’s more northern areas in September. South Tyrol’s climate makes the holiday region in Italy’s north a holiday paradise par excellence. You love summer in South Tyrol? Then you shouldn’t hesitate and make one of the five Dolce Vita Hotels your holiday residence in South Tyrol because summer here lasts longer than elsewhere. The sun warms the valley and the slopes of the mountains until October. The Merano Region offers ideal conditions for golf and hiking - or for simply enjoying the mild temperatures in the enchanting Mediterranean gardens of the Dolce Vita Hotels. Thanks to the Mediterranean climate, swimming pleasure in South Tyrol can be enjoyed all the way into September. The term ´Altweibersommer´(Indian summer or gossamer) describes a period of time in September when the weather is consistently good. The term originates from Germanic mythology and refers to the gossamer which the young money spiders use to abseil down. The spinning of the webs is called ‘weiben‘ in old German. These spider webs can be seen on exceptionally warm and sunny days in autumn. According to popular belief, if the gossamer gets caught in a young woman’s hair then a wedding is not far. That’s why in South Tyrol the ‘Altweibersommer´ is also known as maidens‘ or women‘s summer. Enjoy a magical ‘Altweibersommer‘ in South Tyrol at the five enchanting Dolce Vita Hotels in Naturns and Latsch near Merano: extend the warm season and experience a summer after the summer in South Tyrol. 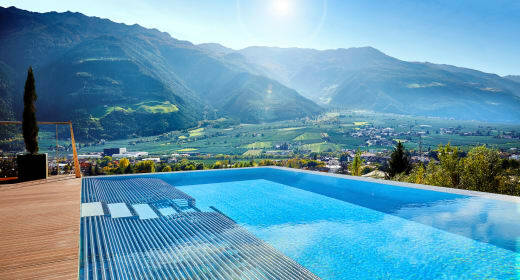 The Dolce Vita Hotels are located in South Tyrol’s sunniest valley. The Vinschgau District spoils its guests with 315 days of sunshine per year.